Great achievements follow all that has come before and influence all that will come after. While the ultimate outcome most widely known and celebrated by the broad public may be widely known, often the critical accomplishment to realizing that outcome is not that event per se, but a prior event. This idea—that what you do before what you ultimately aspire to do is most important—was captured well by renowned basketball coach Bobby Knight, exhorting his Indiana team to win a certain critical game, proclaiming if they could win a critical game they could “get in position to get in position,” to contend for the NCAA national basketball championship as related by John Feinstein in his classic, Season on the Brink. The critical game that launched and secured the San Francisco 49ers dominance of professional football in the decade of the 1990s and then into the 90s was the 1981 NFC Championship Game against the Dallas Cowboys. 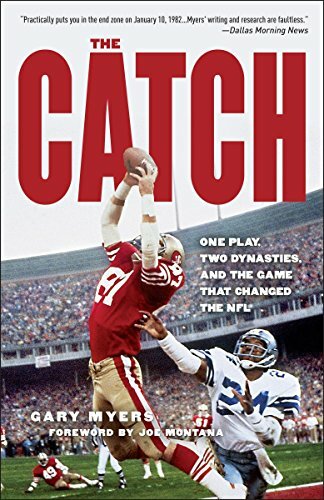 A single play, a six yard pass to wide receiver Dwight Clark—thrown so high that some thought that quarterback Joe Montana was purposely throwing an uncatchable ball—determined the outcome of that game and so much else and is the focus of Gary Meyers in The Catch: One Play, Two Dynasties and the Game that Changed the NFL. The Catch is a fascinating chronicle of the key play of a memorable football game, fascinatingly developing the back story of what came before this inevitable play, chronicling the confluence of events, circumstances, and decisions that led the players to be on the field at that place and time. Similarly, the author unfolds what transpired in the ensuing years, how the play triggered the rise of the 49ers, and the decline of the previously dominating Dallas Cowboys, how the very nature of football changed, and how the life paths of the people involved were similarly realigned. Exploring the same event from multiple participants’ perspectives, Gary Meyers sets the stage for what led up to the play and what the play meant to what transpired subsequently. He writes, “One play changed it all. The 49ers became a dynasty, and the Cowboys went into storage for a decade. Bill Walsh became the genius, and Tom Landry became a sympathetic figure. Joe Montana became Joe Cool and Dwight Clark became the hero of overachievers. This great play came three years into the professional football careers of Hall of Fame quarterback Joe Montana, who threw the pass and outstanding receiver Dwight Clark, who caught it, and the legendary San Francisco 49er football coach Bill Walsh. The author brings a distinctive perspective to exploring what came before and what came after The Catch, for he observed the classic play on January 10, 1982, as a sportswriter signed by the Dallas Morning News to cover that city’s football team in his first month as a sportswriter. To get to this position to win the Super Bowl, the San Francisco 49ers must first qualify for the conference championship. Winning the conference championship required beating the Dallas Cowboys, their nemesis. One measure of the superiority of the Dallas team was that the Cowboys were essentially indifferent to the 49ers. The play that won the game and has become arguably the most celebrated of all in football history, was practiced many, many times before but never in practice had it worked out the way it did in the game. As many times as Joe Montana had practiced throwing the ball to Dwight Clark in practice, the play had never worked. Right sprint option play, the wide receiver Freddie Solomon—a receiver other than Dwight Clark—was the primary receiver. Dwight Clarks’ role was as a secondary receiver, to be thrown to only if the primary receiver was covered or not in a position to make the play. As it happened on the play, Freddie Solomon slipped and was not a factor. The first time the play worked was in the NFL Championship game. But the 49ers coach, Bill Walsh had intended to draft Steve Dils, the quarterback who had played for him at Stanford. Just before the draft, he shifted his intentions to Joe Montana, who had been recruited to throw passes to James Owens, a talented receiver that San Francisco had targeted as their prime prospect. While the receiver turned out not to live up to his advanced billing, the quarterback recruited to throw the ball so the coaches could evaluate the receiver turned out to be the real find. A similar but reversed story led to Dwight Clark being selected by the 49ers. Wanting to evaluate prime prospect Clemson quarterback Steve Fuller, the 49ers called to schedule a workout. It happened that his roommate Dwight Clark, just before leaving to play golf, answered the phone. When asked if he would help his friend with the workout—after all, a quarterback needs a receiver—he readily changed his plans. Just as Joe Montana had impressed the coaches in throwing to the receiver, this time Clark the receiver impressed the coaches. Notably, the Dallas Cowboys had also looked at Dwight Clark, but judged him to be undraftable. Describing Dwight Clark’s reaction to being invited him to work out with his teammate, Gary Meyers writes, “He was not expecting to be drafted. Having Walsh being invited to Fuller’s workout was like skipping the ‘American Idol’ auditions and making it right into the finals. This was Clark’s opportunity to make an impressions even if Walsh’s intention was for him was to give Fuller a target. “When they were done, Walsh liked Fuller, but he loved Clark.” To the surprise of many, the 49ers drafted the unheralded Dwight Clark in the 10th round. In four years at Clemson he had caught only 33 passes, but under the Bill Walsh West Coast offense system, he flourished, catching 85 passes for 1005 yards in his rookie season, a total in his first professional year that was ten times what he averaged in college. Sports in contemporary societies are sources of myth. The Catch eloquently captures attributes of myth: faith and frustration, loyalty and sabotage, chemistry and skepticism, respect and disdain, calculation and serendipity, scheming and deceit, brilliance and mistakes, intensity and spontaneity, maneuvering and manipulation, arrogance and selfishness, respect and feuds, slights and insults, belief and confusion, pride and ego, bravado and insecurity, utter dejection and exhilaration, aspiration and disappointment. The Catch epitomizes why sports are such an engaging element of American culture. The key critical protagonists who prevailed that day, January 10, 1981, in San Francisco had all encountered discouragement, rejection, disappointment, at earlier stages in their lives. And all were there only because of circumstance. Both Dwight Clark and Joe Montana converted unintended auditions, both being viewed by the coaches as a receiver and quarterback to facilitate other players’ workouts, into draft picks, roster positions, success on the football field, superstardom, wealth and fortune. Bill Walsh’s overcoming early discouragement and reversals, applied his ingenuity and creativity to his craft, his spontaneity to recognize talent, to shift his priorities, and cultivate players who along with many others became the nucleus of building a football dynasty. The Catch is a great book appealing to anyone interested in football, especially those interested in the San Francisco 49ers. But the book is of even greater interest to those who are concerned about culture, the path to excellence, how many different factors, both those designed, but most especially totally unanticipated and unplanned influence outcomes. Certainly, the close friendship and great chemistry between quarterback Montana and receiver Clark were essential in knowing where to be when, to having just the right touch to make the play.